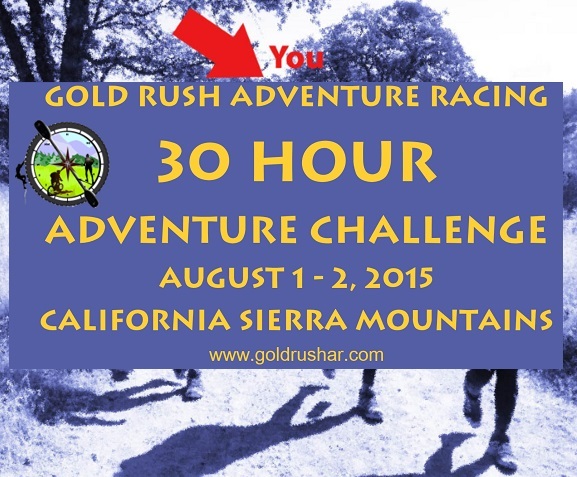 The major event in the 2015 Gold Rush calendar was the Gold Rush 30 hour event. Teams started with a paddle on Spicer reservoir followed by a spectacular trek over bare granite and high altitude terrain around Uttica and Union reservoirs and then into the canyon of the Stanislaus River. The canyon led down to a deep pool where CP 10 marked the start of the flagged route to the climb site. A scrambling, rope protected traverse led to a sharp ridge from where a 250 ft rappell dropped teams onto gnarly talus of huge boulders. Teams made their way to the bridge over the Stan rivwer where dedicated volunteers accepted their climbing gear to lighten the loads for the tough descent of the Stan River canyon. Many teams remarked (complained) about how tough the rocky brushy terrain was. Jamie of 'And Loving It' fell in a 10 foot 'rock crevasse' hidden beneath the manzanita. Amazingly , all the teams made it to TA2 to pick up bikes. Unfortunately, Stephanie Briggs of Team 'Recalculating...' had to stop with an injured knee. Her teammates continued. Teams picked up bikes at TA2 and headed through a maze of forest roads toward the town of Arnold. Many of the route choices involved rocky narrow trails that rarely see a vehicle. Water was sparsely available and teams had to plan ahead. Sadly Jen Andrews took a fall after just 2 miles and her team 'Astra' had to bail to the main road, Hwy 4, to find help for her. All other teams continued through the night and early morning hours of Sunday until they reached the town of Arnold to attempt the single track biking of 'Arnold Rim trail'. The first team to the finish line was 'And Loving It... ' but their early arrival was only possible by skipping check points. The remaining teams finished through the late morning and early afternoon. Team 'Recalculating...' scraped in just 1 minute before the cutoff and before incurring penalties for exceeding that cut off. 'Nor Cal Adventure Racing' arrived mid pack but had visited the most checkpoints and scored a win with their strong performance. If you read this far you are a committed Adventure Racer and need to put next years Gold Rush events on your calendar! Come and join us for a fun event that you can complete in a weekend. Check in on Friday evening in Avery (20 miles above Angels camp on hwy 4), California. Race from 7am Saturday until the cut-off at 4pm Sunday. Then kick back for the post race meal..
Check-in, start and finish at Avery California. Great facilities around Arnold and Avery to keep friends and family entertained while you race. Or send them to us as volunteers! Camping is available at the registration location. We hope you will join us there. Motels are available in Arnold and the surrounding area.or there are other campgrounds nearby. If you don’t make it to check-in between 6 and 7pm, we will work with you to get check-in later in the evening. But if you come too late you will miss dinner, briefing and lose maps time! Friday evening: Race Briefing 8pm.